Last week the British Museum held an exclusive morning view for families of their exhibition Ancient Lives, New Discoveries. The same price as a normal ticket got you exclusive access to the exhibition (apart from members of the museum), a tour by the Exhibition Curator and a free tea or coffee afterwards. Plus the promise that you wouldn’t feel pressured to keep your kids quiet – just what every mum of a toddler wants! The tweenager is back at school, so in our group were two adults, two toddlers, and the baby. I’ll focus on the exhibition as it was the main purpose of our visit. But I can’t ignore the way I felt almost as soon as we stepped into the main museum. My oh my. This goes down as my most stressful museum visit since, well, 2004*. As a seasoned museum visitor and a mum of three I have nerves of steel – but even these were severely tested. 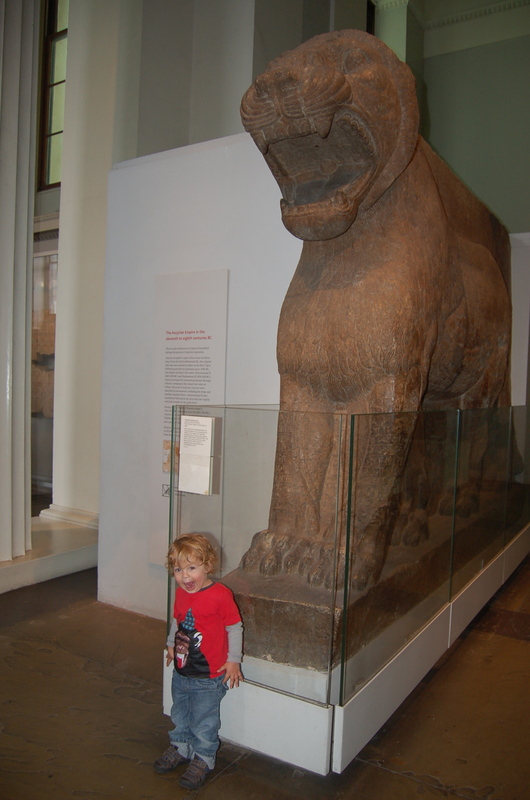 The British Museum turned out to be one of the least friendly places I have ever taken a toddler. But more of that later. 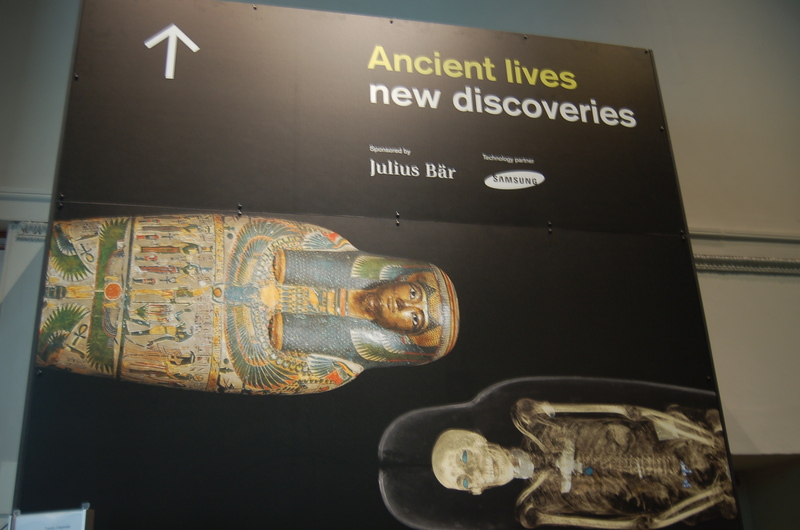 Ancient Lives, New Discoveries is an excellent exhibition. Eight mummies, never before unwrapped, have been put through a CT scanner to see what their remains can tell us. It’s a great idea, and the resulting exhibition is gripping (and this from an Egyptian novice). As well as easy to understand text panels, interactive technology is brilliantly used to convey the findings. In places, on large screens you ‘scroll’ like on an iPod wheel to see a 3D image of the body turned, or peeled back to search for amulets and look at internal organs. The first body we meet was preserved naturally by the sands of the Sahara desert, others have been artificially mummified. Through these scans we learn their age, height, gender (not always what is indicated on the sarcophagus! ), any health problems and how they were mummified. One poor man post-death had the indignity of his head being detached during the embalming process – it was crudely stuck on with a stick. Most poignant was the mummy of a two year old boy, the same age as my own son. Combined with what is written about them on the sarcophagus, what they were buried with, and what is known about the culture of the time it feels like you are finding out about a real person, not just a ‘mummy’. Each person’s story is used as a way give insight into a part of Egyptian culture – so musical instruments of the time are displayed near a temple singer. 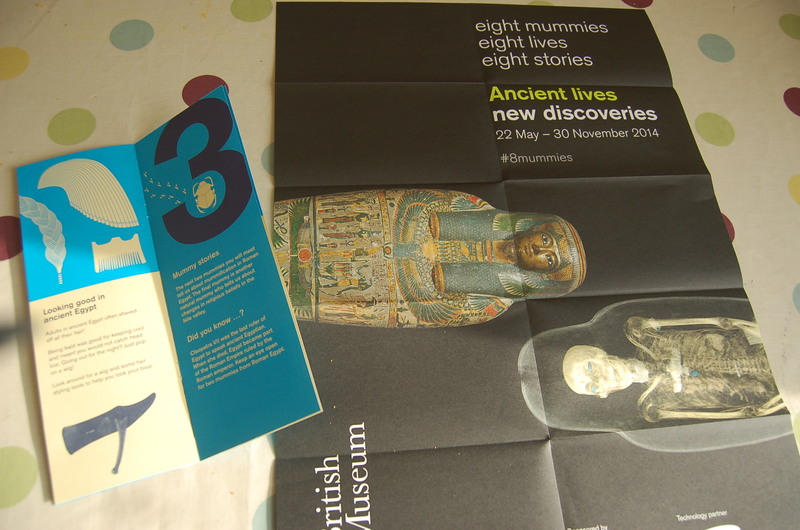 A great exhibition then – and one that I would definitely recommend for older children, say over the age of 5 (when the interest in mummies really bites!) However it wasn’t designed with a younger audience in mind. The toddlers quickly lost attention and ran around looking for elephantoms, or each other. 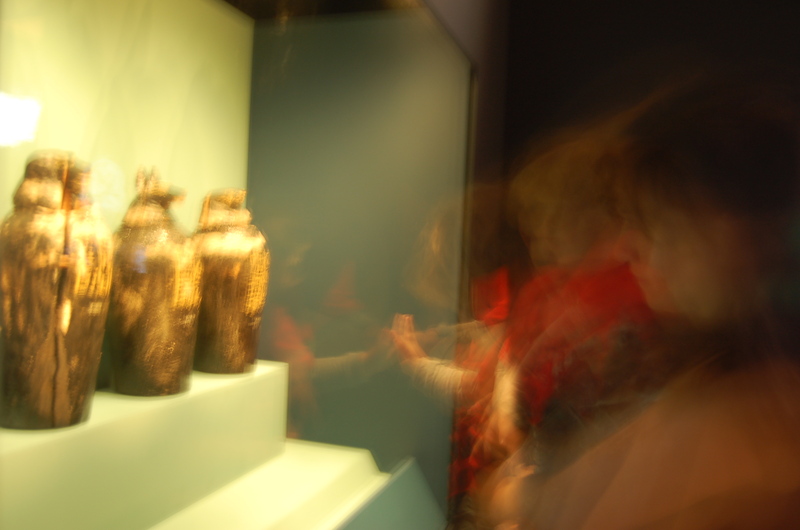 When I could catch him and make him look, there were parts my son really liked – like the animal heads on the canopic jars, or the crocodiles that a statue of Horus was standing on. But it felt like hard work doing so, both physically having to lift him and constantly having to be on hand to point out what was of interest. I tried to listen to the (adult-oriented) exhibition tour. Unfortunately my son shouted ‘mummy!’ repeatedly so loudly within the first three minutes of the talk I thought I’d better give the poor guy a break and take my toddler to wreak havoc elsewhere. Future special openings could easily make some small changes for toddlers. Stepping stools would mean exhibits can be easily viewed by the shorties, and the interactives would be more reachable too. Even better would be in-gallery toddler activities – anything from Egyptian mask face-painting, to story time, or handling sessions – for example, to tie in with the harps and musical instruments on display. 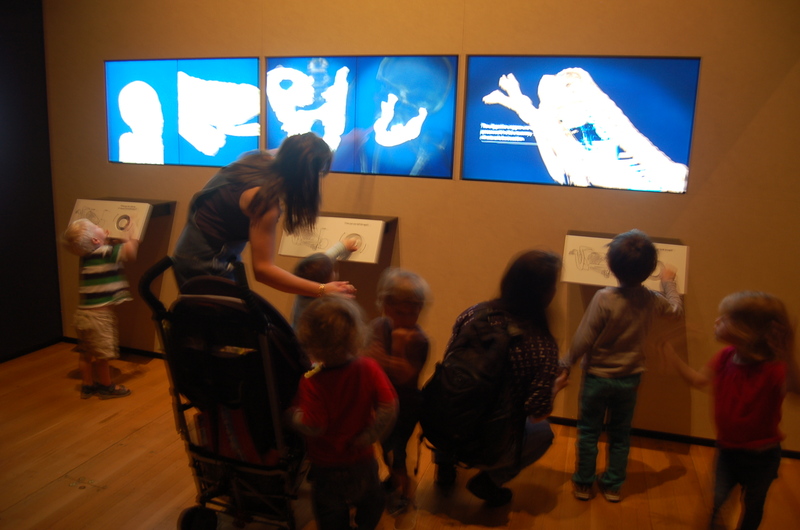 Whilst an exhibition tour for adults is great for those with babies in slings, or quieter children (if such a thing exist! ), a children’s led tour or hunt would be more appropriate for toddlers like mine. The setting aside a special time for families with young ones to come is a great idea, and I really hope many more such events like this are run. Like many of the other national museums, the British Museum exhibitions can be incredibly busy and very unwelcoming to those burdened with a buggy. At a trip to their Vikings exhibition earlier in the year, I saw a woman ask for her money back because there was no way she could get a buggy round without glares, tutting and negative comments from other visitors. She’d made it as far as the first room. The most fun we had all morning! Maybe I am a terrible mother, ‘allowing’ my child to behave like, well, a child. The fact that I was constantly asking him not to do such childish things, and trying desperately to interest him in the exhibits just made me all the more resentful of the approaches by the guards. I use the word guards deliberately, as the staff I met didn’t feel like ‘hosts’, there to help me enjoy my visit. I could have done with some help, not criticism! There’s nothing like a ticking off (or three) to make you feel unwelcome, and after our teas I was glad to leave the museum, unfortunately feeling incredibly stressed. Recently I’ve been reading the Kids in Museums manifesto – and one point in particular struck a chord. I paraphrase – if kids are misbehaving, as yourselves why? Are they excited, if so harness it. If they’re bored, give them something to do. Here’s a radical idea – what if, instead of telling my son what not to do, the guard had pulled a toy out of his pocket, pointed out something amazing, or done something crazy like a magic trick? Instead of telling me to control my son, he’d asked if I needed any help, or offered sympathy? Perhaps nothing would be different – apart from making me feel a lot less like a failure, and more willing to return. Please, please do visit this fascinating and insightful exhibition. Go on your own, take your older children, take a newborn in a sling – just leave your buggy and older baby or toddler at home. 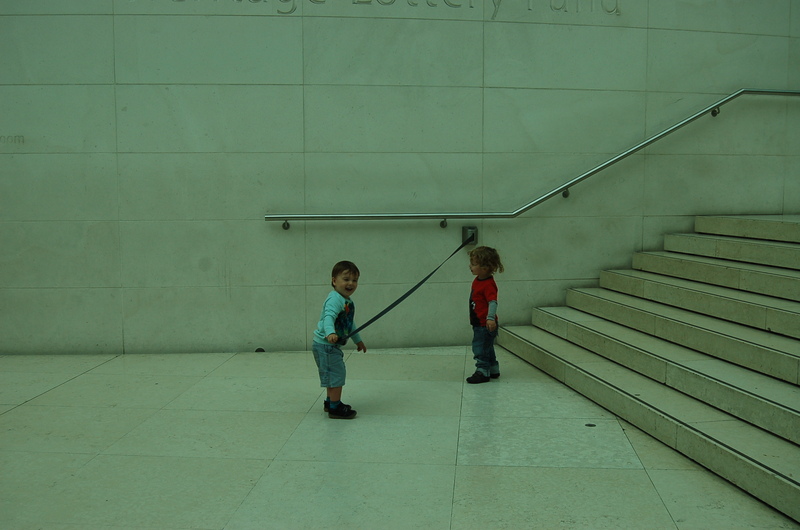 I look forward to future family viewings at the British Museum – hopefully it is through recognising the value of initiatives like this that the Museum will change from an arduous place into something much more welcoming for boisterous toddlers and buggy-pushing parents. *2004 is the year my daughter vaulted a barrier to touch an unglazed Francis Bacon painting, whilst two guards ran towards us shouting ‘stop!’ I’m still not over it. Booking: Recommended, £1 per ticket booking fee. A small number of additional tickets are made available onsite each day. Baby changing: There is a wheelchair accessible baby changing facility just outside the exit of the exhibition. It has a fold down changing table (no strap), lots of daylight, and a toilet for the adults. A simpler changing facility is available in the Great Court – a worksurface with mat on and integrated sink (no strap). If you leave the door open here all the tourists will think it’s the toilet and come in looking confused! Breastfeeding friendly? : A bench was available just inside the first room in a dimly lit area. Toddler time to toilets: A couple of minutes if you dash out of the exit to the accessible toilet there. Nearest playground: You’re five minutes from Russell Square with its water feature that kids love to play in, or for a proper playground, the brilliant Coram’s Fields is a 15 minute walk. Food: In the Gallery Cafe, one child (under 12) eats free when you buy an adult main meal. We often take my daughter to the original Wagamama, although from memory there’s a lot of stairs so I wouldn’t go with a buggy. If of the picnic persuasion, I saw families eating on the plentiful benches outside the museum, under the portico. There is a fab family trail of Ancient Lives available free outside the entrance to the exhibition. You can also download images of the exhibits to prepare your children before you come – http://www.britishmuseum.org/pdf/Imagebank_%20ancient%20lives%20MUMMIES.pdf. What a great idea! On weekends and holidays, family trails for the rest of the museum are available from the Families Desk in the Great Court. The joys of Carnaby Street and Oxford Street are nearby if you have a child who likes to shop, or a pleasant stroll through Bloomsbury will take you to the Grant Museum, reviewed here. It can be so tricky finding the right thing to take your children to. We want to educate them and do need the right environment. I love your suggestions of the guards being more interactive with us visitors, that could bring the place to life. I suggest more hands on museums that actively want children to touch and learn eg the science museum. Thanks for the review I think I will go! Thanks Brighton Claire! I know, it’s hard to tell what they will and won’t like – and that can depend on the day/weather/energy levels/what colour top you put on them anyway! Glad you liked the review and let me know if there’s any others you’d like to hear more about. I plan a trip to the South Coast very soon to check our your museums!